NETWORK UPDATE: The only adjustments from this morning’s numbers were 0.1 increases for the reruns of THE BIG BANG THEORY and ELEMENTARY. CABLE HIGHLIGHTS: ESPN’s NBA PLAYOFFS game towered over everything on broadcast or network TV at 2.73, while NBC Sports Net’s NHL PLAYOFFS were at 0.64. Syfy’s WWE telecast rose 0.09 to 0.71, with lead-outs LOST GIRL at 0.23 and OLYMPUS at 0.18. LIP SYNC BATTLE (Spike) fell 0.08 to 0.69. BRAXTON FAMILY VALUES (We) was at 0.59, with lead-out CUTTING IT IN THE ATL at 0.39. On MTV, RIDICULOUSNESS gained a tenth to 0.46. PAWN STARS (History) was down 0.12 to 0.44, airing after a clip show at 0.42, and lead-out LOST IN TRANSMISSION fell 0.07 to 0.35. 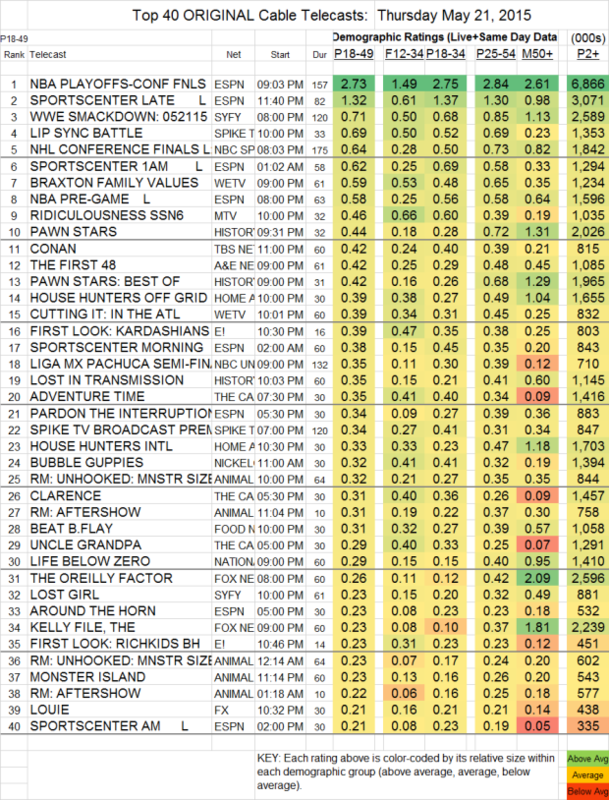 A&E’s FIRST 48 lost a tenth to 0.42. On FX, LOUIE downticked to 0.21, and THE COMEDIANS gained 0.04 to 0.18. Bravo’s REAL HOUSEWIVES OF MELBOURNE held at 0.18. In the micro-rated region, MARON (IFC) held at 0.03, up slightly in total viewers to 93K.